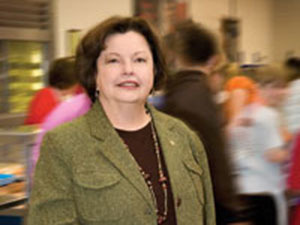 When Mary Lou Henry, foodservice director for Knox County Schools in Knoxville, Tenn., noticed a recurring—and expensive—problem with equipment becoming clogged due to minerals such as lime and calcium present in hard water, she found the solution was installing a water filtration system. “I realized the problems were not with the equipment but rather with the water, so I installed a whole kitchen water filtration system. Not only did it take care of the clogged water jets, but also in a matter of months, the interior of the dish machine looked new again. The trays were free of the white scale buildup, the need to de-lime was dramatically reduced and we no longer needed to install the small cylinder-type filters on ice machines and steamers, which were ineffectual. Also, [we discovered] the quality of foods and beverages that use water in their production, such as tea and mashed potatoes, improved, which resulted in a better end product.